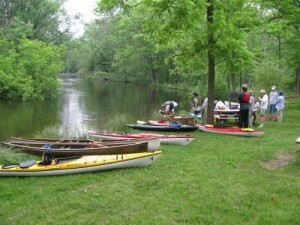 The next nationally designated water trail? The Secretary of the US Department of Interior Ken Salazar just announced a new National Water Trails System as part of President Obama’s America’s Great Outdoors Initiative. This comes in advance of a White House conference this Friday on Conservation: Growing America’s Outdoor Heritage and Economy, that I will be attending in Washington, DC. I am very excited about this focus on rivers as one of the pillars of the America’s Great Outdoors Initiative and the emphasis on the conservation of rivers. In introducing the National Water Trails System, Secretary Salazar used the same language as HRWC’s RiverUp! project, “Historically, we have had the backs of our communities to our rivers and waterways, and we want to turn the faces of our communities toward the river to transform the Huron River corridor”. This recognition of the integral and important role of rivers in our communities–as economic drivers, recreational havens, and opportunities for art and cultural destinations–is exactly the direction we are aspiring to. Atlanta’s Chattahoochee River became first national water trail designated and we hope the Huron River will receive this designation soon.